The Seattle Seahawks have made this free agency period count. First, they sign their best returning offensive free agent, Marshawn Lynch, to a long-term deal without having to place the franchise tag on him. Next, they re-sign their best returning defensive player, Red Bryant, to a long-term deal, again without having to franchise him. Then, they sign a high quality defensive end, Jason Jones (formerly of Houston), to upgrade their D-Line. And now, drum roll please, they add the missing piece to the offensive puzzle, the QB of the future in Matt Flynn. Yes, Flynn is a risk. He’s played two brilliant games. Other than that, you bank on the training he’s received under Mike McCarthy and Joe Philbin, backing up arguably the best QB in the game, Aaron Rodgers in Green Bay. But let’s be serious, any QB is a risk, even Peyton Manning. Manning, who snubbed the Hawks advances and obviously wasn’t interested, hasn’t played in well over a year, and is coming off serious neck surgery. The QBs in the draft outside of Andrew Luck and Robert Griffin III are all projects and a reach at where they draft. Flynn at least has had success when given a shot. This is definitely NOT Charlie Whitehurst. In addition to the training as the 2nd String (not third) in Green Bay, he also led his college team (LSU) to a national championship. Dude is a winner, has some pedigree, and is worth the risk. He is also still young and has a ton of upside. What I love about Pete Carroll and John Schneider is that they refuse to stand pat. They are constantly looking to improve the team and are willing to make moves to do it. Fearless. They have also shown to be very savvy in the draft. Heck, they have done what they need to do in free agency outside of adding depth. Now they can go into the draft and pick the best players; not reach out of desperation. Call me crazy. Call me a “homer.” Call me whatever you want. I have a funny feeling about this one. 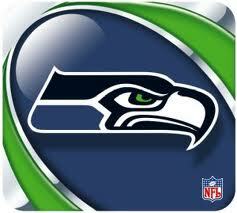 It’s the Seahawks 24-23 over the Saints with an Olindo Mare FG at the end…. Watch for my Tweets during the game. I asked for it and I got it. The 12th Man indeed showed up and so did the Seahawks defense. That was the loudest stadium I’ve ever been in and definitely had playoff atmosphere. The Hawks fed off it and it turned into another NFC West banner in Qwest Field. I couldn’t believe arguing with people on the ferry ride home about Charlie Whitehurst’s performance. The dude was on the winning side of the game, for goodness sakes! Don’t get me wrong, I don’t think he’s our next franchise QB. However, he played a decent game (in fact his stats were better than Sam Bradford’s). His mobility saved easily 5 sacks and actually picked up positive yardage. Charlie’s job was to not lose the game and that’s exactly what he did. He’s a capable backup, a young guy who’s learning, and played a solid game. ESPN’s Trent Dilfer (a guy who won a Super Bowl as a “solid” QB) said as much after the game. Cut the guy some slack. He played a game good enough in the biggest game of the year. The defense was crazy. I know it wasn’t the New England Patriots, but Sam Bradford has had an excellent rookie year, and Steven Jackson is a stud. To hold the Rams to 2 field goals was unbelievable. I loved how Aaron Curry, Chris Clemons, David Hawthorne, Lofa Tatupu, and Marcus Trufant played. Will Herring played a great game. This was a total team effort and a sight for sore eyes. Pete Carroll is the right guy for this city. He brings a great energy that really gets the 12th Man going. I think good things are on the horizon. I expect that Matt Hasselbeck will start if he’s healthy. He’s the veteran; he’s got playoff experience; he played a good game against the Saints last month; and he’s the right guy. However, if he can’t go or plays poorly, I have less issues with Charlie Whitehurst than I did 2 weeks ago! Marshawn Lynch bounced back after being stripped of the ball and ran in “beast-mode” the rest of the way. He could not be stopped in the 4th Quarter when the Rams knew we were running. I don’t care what our record is. The Mariners won 116 games in 2001 and didn’t win the American League to go to the World Series. This is about getting to the playoffs by winning your division. I just LOVE that the Giants, who humiliated us at home earlier this year, aren’t even in the playoffs. That’s really cool. This was a huge win for this franchise. Just like the University of Washington needed a bowl game and the rest was gravy; the Hawks needed to get to the playoffs and the rest is gravy. Two years ago, the Huskies were 0-12 and the Seahawks were 4-12. Now, the Dawgs have upset Nebraska in the Holiday Bowl and the Hawks are NFC West Champs. Unreal. After 8 years left out of the dance, and without a bowl win since Marques Tuiasososopo led the Dawgs in the 2001 Rose Bowl, Jake Locker and the gang brought the University of Washington back to relevance in college football. I thought the game would be close, but I didn’t think we (especially the defense) would dominate. The score wasn’t indicative of the route. A couple missed field goals (one of the upright), a wide-open Jermaine Kearse being overthrown by Jesse Callier, and not being able to punch it in from 1-yard out on two occasions could have really made the score look bad for the guys in red. Steve Sarkisian gives me the impression he’s a lot like Don James was. Give the guy 3 weeks to prepare and he will beat you. Nick Holt had been much maligned for his defense’s efforts this year. He and his unit made up for it big. Kudos to him and his staff. Jake Locker can now cement his place in Husky history. 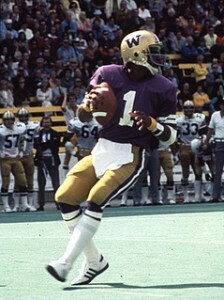 In my nearly 40 years of watching Husky football, I rank him behind only Tui on the all-time QB list. Mason Foster would look good in a Seahawks uniform. I think he’s better than Lofa Tatupu and Aaron Curry right now. If recruits are looking for a team in the Pac-12 (weird, huh) trending up…look no further than Seattle. You have a hot coach and a hot program. Thank you Jake for staying. You passed up a lot of coin and you were rewarded. You may even get to be drafted by a better team in the NFL now. It’s great to be a Husky! Now if we can get Sark’s old boss to fire up his squad for Sunday, this could be a really great New Year’s weekend for football in Seattle! So here we are. After 8 long years, the Huskies are back in a bowl game. Jake Locker, Mason Foster and the rest of the seniors finally have their moment in the sun, or rain, in San Diego. The three games leading up to this were their season. Those wins put them back into post-season and makes tonight’s game gravy. They’re expected to lose big on the scoreboard, but they’ve cemented a winning season in the perception and hearts of Husky Nation. This was the goal. I think the game will be closer than 3 months ago. I do expect Nebraska’s talent to win out in the end, but I’m thinking more around a score of 27-17. If the Dawgs keep it within 10 points going into the final quarter, it could be interesting. A win would be of legendary proportions. I’m a Matt Hasselbeck fan and always will be. Just like I was with Jim Zorn and Dave Kreig. However, just like with those two “ring of famers,” it’s time to move on. Not that Matt can’t still play because he can. He’s a system QB…Mike Holmgren’s system. He’s struggled under Greg Knapp and Jeremy Bates. He needs to find a team with a true West Coast offense (perhaps Cleveland if the big guy fires Eric Mangini and takes the reins himself). Charlie Whitehurst is NOT the answer clearly. Quarterback is the most important position on the team. All the elite teams have at least “very good” QB’s. So where do the Hawks go? The draft. I’m not advocating Jake Locker necessarily. I don’t think he’s ready to lead an NFL team right out of college. We have no chance of drafting Andrew Luck who can. I’m intrigued by Arkansas QB Ryan Mallett. The dude is 6’7, has a rifle arm, had a tremendous senior season, and is exactly the kind of guy who can run this offense. Problem is he’s a junior and we don’t know if he’s coming out yet. We also don’t know if we’re playing football on Sunday’s yet either as there could be a lockout. If you can sign Matt to a one-year deal, I’d do it knowing that there must be a replacement soon. Otherwise, go a year with Charlie and see if he can prove me wrong. If Mallett comes out, I’d take him. Regardless, the changing of the guard nears and it will be interesting to see which direction Pete Carroll goes. As his ultimate QB goes, so will he and his tenure here in Seattle. We are still in a playoff race. As bad as we’ve played, we are still tied for first place in the NFC West and have a shot at a division title. If this was a lost season, I’d say give Whitehurst the opportunity. With a playoff spot up for grabs, I’d prefer to go with a guy whose taken his team to 4 straight division titles and a Super Bowl. Yes, Matt’s got culpability for our losses, however he also needs props for the wins. He’s played well in those victories and I believe deserves the chance to finish the deal. Charlie Whitehurst played well yesterday in a mop-up role. His only start, he was terrible. He creates too much of an unknown. Throwing him into a road game at this stage is a bad move. Pete Carroll must show consistency and stick with the leader of the team. Next year may be a different deal, but it’s not the right time to make a switch for morale. My guess is that you will hear Pete Carroll announce that Matt Hasselbeck will remain the Hawks QB. You will hear an outcry of angst from the Seahawks faithful. However, it’s the right decision based on the timing and out precarious position atop the NFC West. 1. The Apple Cup win saved the season for the Huskies. Now, there is a definite step forward from last year. Had they lost, they would have had the same record, the same “no bowl game,” and would have wasted Jake Locker’s senior season. 2. Jake Locker’s legacy is cemented. 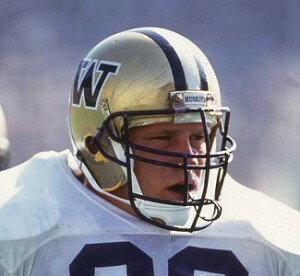 Without a bowl game, Locker would have been thought of as simply a great talent in a tough time. Now, he’s the guy who brought the program back from the darkness to a bowl game. 3. No matter what happens now against Nebraska, the Dawgs season is made. They can play footloose and fancy-free and I believe will be more competitive. If they pull off a miracle win, the season will go down as one of the greatest ever based on where they were 4 weeks ago and where they’ve been the last 8 years. 5. I’m glad they kept Tyrone Willingham that extra year. Made it possible to hire Steve Sarkisian. All things for a reason. 6. I don’t know what Pete Carroll said at halftime against Carolina, but he needs to bottle it. 7. A win against San Francisco on the road makes the only “must-win” game the rest of the way against St. Louis. 8. Matt Hasselbeck must be re-signed. To continue to move forward next year, you must have a quarterback. Ask Arizona. 9. Pete Carroll was the right hire. Last year’s team would have lost by double digits in the same scenario. 10. I love meaningful football games in December! Well, at least you can definitely say these aren’t your 2008 and 2009 Seahawks. A week after being humiliated at home by the New York Giants, the Hawks traveled to Phoenix and essentially knocked the Cardinals out of the NFC West race. Matt Hasselbeck threw for 333 yards and the offense went for over 500. I can’t remember the last time we saw that type of output on the road. And, I hope you’re sitting down, the Hawks have 2 road wins and we’re only halfway through the year! Arizona is three games behind the Hawks with only seven to play thanks to to the season sweep by the good guys. Basically, if the Seahawks win three winnable home games against Kansas City, Carolina, and St. Louis, the Cardinals would have to go 6-1 to beat them. They won’t do that with either Derek Anderson or Max Hall. Game over for them. San Francisco knocked off the Rams in overtime giving Seattle sole possession of first place, and keeping there hopes alive. If Seattle can win in SF, they would basically eliminate the 49’ers. Pete Carroll is a difference maker as a coach. I like Jim Mora, but there’s no doubt Pete has his stamp on this organization and it’s a better fit. He almost wills “positiveness” and the results show through on the field. Even after two lopsided losses back to back, they were able to come up with an impressive road win when the Cardinals had to win. Matt Hasselbeck is the QB. Period. If what we saw last week from Charlie Whitehurst didn’t show you enough, today’s game did. I like Charlie and he’s probably going to make a capable back up in this league. But, he’s not even there yet. If Hasselbeck loses time due to his wrist injury, we’ve got major problems. I think I’d prefer to give the ball to J.P. Losman. The defense is good enough to win the division. They certainly aren’t dominant, but they are good and consistent. Remember that they kept us in the Raiders game until late in the 3rd quarter. If the offense can be even slightly efficient, they can be really good. We need to get better at scoring touchdowns. I would prefer to see a two-back set on the goal line. I think we really miss fullback Michael Robinson. We need to get a big person (even a lineman) who can lead block for Marshawn Lynch. This was a big game for the Hawks. If the goal is to win the NFC West (which of course it is), then this win makes next week way less important. Depending on #8’s injury, I would consider starting another QB (I’m pulling for Losman) on the road against the Saints and make sure Matt is healthy for back to back home games against Kansas City and Carolina. If we keep winning at home, I believe that will win the division. High School Football – I was at the North Kitsap – Bremerton game Friday night. Bremerton dominated. RB Kyle Kennedy (amended) reminds me of John Riggins. They trounced the home-standing Vikings and deserve accolades for the win. Why is this an “Ugly?” Because Bremerton coach Nate Gillem allowing his team to humiliate an opponent is totally classless. Bremerton intercepted a Viking pass on their own 3-yard line with only a couple of minutes left in the game. They were winning 35-7. Game over, right? Wrong. After getting out of the shadow of their goal line, Bremerton preceded to pass the ball downfield (with their starters) to attempt to score again. They threw long, they ran trick plays, as NK coach Steve Frease screamed at them from the other side of the field with his finger pointing to…the scoreboard. With seconds to go, Bremerton ran a reverse play to score a TD. Not an off-tackle, not a dive, but a reverse. Thank goodness they were called for holding, so it didn’t stand. They then kneeled down to end the game, but the damage was done. Gillem explained they needed the win (already firmly in place by only 4 tD’s). He also said he let his players call the plays. Great. So that’s why every coach on your sideline was encouraging the players to score. Sportsmanship needs to at least stay in high school sports. In an era where parents are out of control on expectations, and kids are being wooed by colleges at younger and younger ages, you’d hope coaches would at least show some measure of respect and charity. I’m all about winning. I’m not about humiliating kids and coaches in front of their fans. Coach Nate Gillem was way over the line and should be reprimanded. His players should have been in the spotlight after the game. Not him. Bad – the Seattle Seahawks offense. Fortunately for them, the “Ugly” went to someone else. Special teams won the game the previous week. No such luck in St. Louis. Coach Carroll has 2 weeks to figure out a way to make first downs, much less touchdowns. This is getting to be as anemic as the Mariners offense. And they at least had Felix Hernandez to help them out every 5 days. Oh, wait. They never scored runs when he pitched. Never mind. Good – Spectacular – Tremendous – Jake Locker was left for dead by the national media and even members of his local media and fans. Like the Phoenix, he rose from the ashes and single-handedly led his team to a huge victory in Los Angeles over USC. Nebraska? A distant memory. 1-0 in conference and one win closer to a bowl game. If it took the Nebraska loss to catapult them into a positive Pac-10 season, I’ll take that loss every time. That could very well be a season-defining win for this team. P.S. My daughter and I tied for the Fantasy Baseball bragging rights. I guess we will have to break that tie next year! Coach Pete Carroll – OK…I’m IN big time. I read your book, Win Forever and was impressed. Now I’m even more impressed. I know there will be poor games and challenging times. However, this team did not quit like it has the past two years. That’s in part due to your leadership. Welcome back to the NFL. Matt Hasselbeck – I keep telling people if we surround you with talent at WR and RB, and give you time to throw, you’re still an upper-level QB in this league. Who knew you could still run? Tremendous leadership and the same passion that has made you the best QB in franchise history. Jordan Babineaux – After the ignominy of being cut and re-signed for less money, you come back and make a pick and several special teams tackles. Seemed like you were all over the field. Welcome back to the team. Seahawks O and D Lines – Kudos. Both were glaring weaknesses last year. At least in this game, you kept #8 on his feet, held Frank Gore to 38 yards, and pestered Alex Smith all game long. If you can keep this play up all year, we will be looking at more wins than we thought! Jake Locker – Nice bounce back game, dude. You showed why you are a pre-season Heisman- watch guy. Jermaine Kearse – You’re showing that last year was no fluke. You may be the best WR in the Pac-10 and before you’re done the nation may be watching. Tremendous effort! I hope every Monday will have these rave reviews. I’m not naive…I know there will be losses. I just hope there are more goods than bads as we continue the Monday Morning QB!